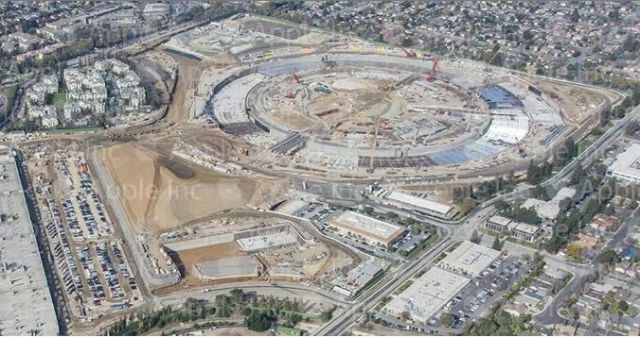 Apple’s Spaceship Campus looks beautiful in new aerial photo. Apple has provided the official City of Cupertino website with a new photo, showing progress on the new, so-called “Spaceship” campus. And it’s starting to look like a thing of a beauty. As you may know, every week, Apple provides a shot to the City of Cupertino to show how work is progressing. The idea is to show Cupertino residents the big picture of the multi-billion dollar construction project that is happening in their own back yards. Motorists can expect traffic delays in the vicinity of the Apple Campus 2 site. Construction work hours are from 7 am to 7 pm weekdays and from 9 am to 6 pm weekends, with additional traffic restrictions (additional lane closures, etc.) occurring between the hours of 9 am and 4:30 pm weekdays. • Lane reductions on Wolfe Road between Pruneridge Avenue and Homestead Road. • Left turns from northbound Wolfe road to westbound Homestead Road are reduced to a single lane. • Sidewalk is closed along the east side of Wolfe Road between Vallco Mall and Homestead Road. • Pruneridge Avenue is closed permanently between the Hamptons driveway and Tantau Ave. The Apple Campus 2 construction is due to be completed by Q4 of 2016, meaning Apple will likely move into the building sometime in 2017. I can’t wait to see what it looks like then. This entry was posted in Apple news and tagged apple, campus, spaceship. Bookmark the permalink. Astounding gif shows just how far the iPhone has come in 8 years.